Disk Defragmenter is a free utility provided by Microsoft, which comes with all Windows operating systems. 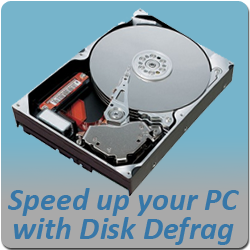 To achieve the goal of speeding up your PC for free, the Disk Defragmenter must be used correctly and to its full ability. Before beginning to speed up a PC, it is important to save all work and back-up sensitive files to an external device that will not be affected by the Disk Defragmenter. To begin the PC speed up close all active programs running in Windows. The reason for closing all active programs is to ensure that Windows has enough system resources to perform the defragment process with no possibility of inadequate processing power. The next very important step in the PC speed up is to ensure that your PC has a continuous source of power. Locate the “Start” button and click it. Select the “System Tools” icon. Select the “Disk Defragmentation” icon. Selecting the “Disk Defragmentation” icon will open the Disk Defragmenter program. To determine if the PC will benefit from a Disk Defragmentation click “Analyze.” Do this for each hard drive you wish to defragment. Defragmenting the hard drive every day will not guarantee a fast PC. Only perform a Disk Defragmentation if the results from the analysis instruct you to do so. The next step of the PC speed up process is to select the “Defragment” button. The computer will now begin to defragment the hard drive. This process can take a long time depending on your computers hardware specifications. After the computer is done defragmenting your hard drive take notice of any error messages generated by Disk Defragmenter. Record any error messages for future use and reference. If your computer uses multiple hard drives you will have to defragment each hard drive individually. After running Disk Defragmenter on your computer’s hard drive(s) close Disk Defragmenter and restart the computer. Using Disk Defragmenter can speed up a PC dramatically under the right circumstances. The best part of all is that this program is completely free and can turn a slow PC into a fast PC. The next time you catch yourself wondering, “How can I speed up my PC for free?” Remember to take advantage of the tools provided to you that are already installed on your computer. Of course, if you don’t have the time to regularly perform a disk defrag on your own, you can try out our Free Computer Maintenance software. Not only will it automatically perform disk defrag on a scheduled basis, it will also automatically utilize Windows’ built-in Disk Cleanup and CHKDSK tools to help make sure your PC stays in top shape. Sign up today… It’s 100% Free!